We start out our week with some collaborative filming with Jeff Chand from Coastal Acupuncture and Wellness in Victoria B.C. We filmed a few videos together drawing on Jeff´s expertise of traditional Chinese medicine and had a lot of laughs. 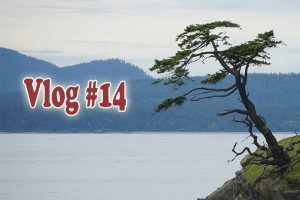 On Wednesday we took a trip to Saturna Island. It is a gorgeous island with a population of about 350 people. We went with a naturalists’ meetup group. It was fantastic because they identified so many plants for us! James Colwater, the leader of the group is an ornithologist and in addition to knowing the behaviour of birds, he is an excellent botanist. We saw eagles, humpback whales, seals, sea lions, otters, deer, wild goats, slugs, loads of birds and wildlife. There was loads of stinging nettle on the island. I had an amazing stinging nettle latte from a fun converted double decker bus. I then recreated the stinging nettle latte at home. I share with you the benefits of consuming nettle. On Thursday morning we filmed Namaste Yoga. We ran into Dale, one of the makers of the Moss lady. He shared with us some of the fun facts and history of Beacon Hill Park. He told us about the hundred and twenty seven year old rhododendron. We filmed in front of a nutmeg tree. I showed you how much some of the plants have grown in Beacon Hill park. We finish up our vlog with mailtime this week. I received lots of mail from you. Thanks to Jenn Ashton for the meditation deck. Thanks to Shambhala publishers for the books to review. I am looking forward to interviewing your authors. Watch all the way to the end for some fun outtakes with Jeff.